What a nightmare..... having had no wi-fi for almost a month, I have had to resort to buying a mobile wi-fi device for my home. There is still no progress on it being fixed (most of the housing estate are also suffering) so I am limited on when I can go online on my laptop. It also means no catch up TV, Christmas shopping on my mobile phone and massive data charges on both mine and my husbands mobile phones. Naturally blogging has had to suffer and this is really disappointing for me. Massive apologies to all my blog readers, fingers crossed it will be fixed in the New Year. Anyway, here I am with my entry for this months Pinkies Team Design Challenge. How cute is this gift bag? 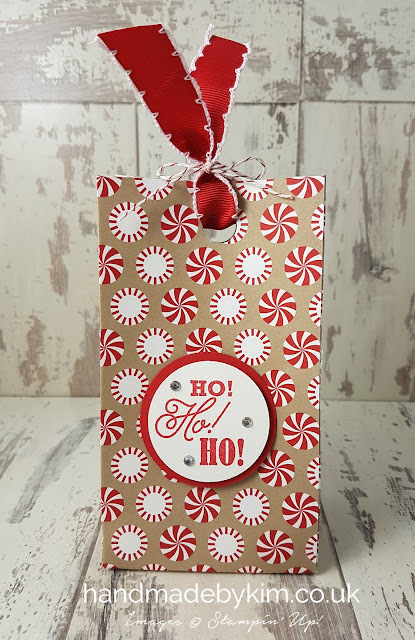 We've been challenged to use punching techniques and for my project I've used the Gift Bag Punch Board and the 2", 1 3/4" and 1/2" Circle Punches. 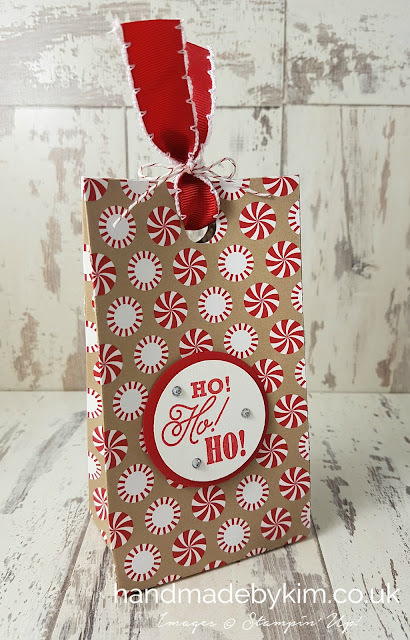 For the gift bag I cut the Candy Cane Lane Designer Series Paper to 11" by 7" and used the medium setting on the punch board. Head over to Michelle Lasts blog on Tuesday by clicking here and make sure you vote for your 3 favourite projects. Voting is live for 3 days and the winner receives a £20 spending spree of Stampin' Up! products as a gift from Michelle. Hopefully I'll be back again for Christmas, but in case I'm not - have a wonderful Christmas!